Bringing together prevention and cure, health and social care, is hardly a new – or strange – idea. So why hasn’t it happened? 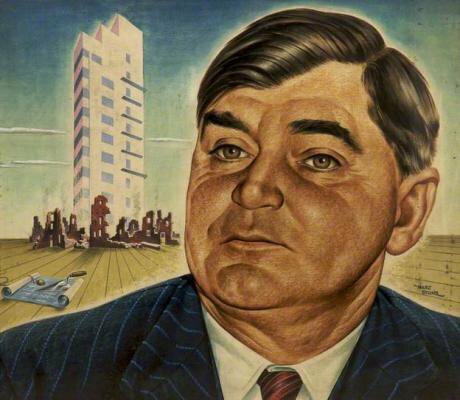 Image: Portrait of Nye Bevan by Marcus Stone, 1945. Credit: People's History of the NHS. The fanfare that surrounded the publication of the NHS Long-Term Plan made sure to highlight its promise that a shift away from hospital treatment will not only save the NHS “over £1 billion a year in new expenditure averted” but also save half-a-million lives. Which rather raises the question: if the locus of care is to be relocated away from the expensive hospital, then to where? There is one popular alternative that has had a difficult history, not least with the Conservative Party, over the past century. In the aftermath of the First World War, Lloyd George was turning the attention of his government to post-war reconstruction and social reform. This included the creation in 1919 of a new government department – the Ministry of Health – under the direction of Christopher Addison, a GP turned Liberal MP and one of the Prime Minister’s closest allies. One of his first acts as Health Minister was to establish a committee under the chairmanship of Lord Dawson, formerly the King’s physician, to investigate the “schemes requisite for the systematised provision of such forms of medical and allied services as should… be available for the inhabitants of a given area”. The committee’s interim report the following year outlined detailed plans for establishing a network of health centres in every area across the country. However, a final report was never written, and the health centres were never built. As Lloyd George’s influence over his own coalition government waned, and the Tories were demanding ‘retrenchment’ – what today we would call ‘austerity’ – a whole raft of social reforms fell to the wayside. Two decades later in 1942, when Britain found itself at war again, Lord Dawson wrote in the British Medical Journal, saying that his long-neglected plans “might well form the basis of reconstruction to-day”. Indeed, by the end of the war, it was widely assumed that the widely debated new National Health Service would include a host of new health centres. Four years before the NHS was established in 1948, before Labour had won the 1945 election and Aneurin Bevan appointed Health Minister, medical social workers were worrying that the inevitable new health centres would be set up too slowly. Hoping to capitalise on the wartime expansion of social services, social workers warned in 1944 that: “Unless health centres are rapidly developed general practitioners will not be able to take full advantage of the preventive and social services existing for the patient’s welfare”. Despite expectations, health centres never really became a feature of the NHS. New health centres were not a priority for a nation in need of much post-war rebuilding. Meanwhile, the leadership of the medical profession was suspicious enough of the new state service, without relocating GPs en masse into NHS health centres. Over the first 15 years of the NHS, only 17 health centres were opened – hardly the national network the Tories had scuppered back in the 1920s. The idea of health centres, as a place to bring together the preventive and curative services of the NHS, had caught on by the 1970s, when their building peaked at 100 a year. These health centres were often built by local authorities, who employed health visitors and nurses, renting out space to GPs and dentists. They proved popular but too expensive for that rate of building to continue once the financial troubles of the late 1970s set in. Efforts since then to radically develop the siting of primary care, to allow for a shift away from expensive hospital provision, have not been easy. Under Gordon Brown, Labour’s answer was polyclinics. They offered the possibility of integrating various health and social care services for those with long-term conditions, but deeply divided opinion. While Professor Darzi saw them as central to his 2008 ‘Healthcare for London’ plan, questions over funding were combined with suspicions on the left over the role of the private sector and those on the right about central government imposing a standardised system on local communities. Polyclinics didn’t survive the arrival of David Cameron’s coalition government in 2010 and they aren’t what the new plan is talking about. As the Financial Times noted, “the NHS cannot close hospitals until new primary care facilities are established”, but there’s no proper discussion of such actual centres in the plan. Instead, there’s talk of digital GP consultations and the promise of £4.5billion to fund the expansion of multidisciplinary community teams to work with local GPs. The idea is that over a number of years, in each area, GPs will enter into a single ‘network contract’ with district nurses, pharmacists, physiotherapists, dementia workers and others, including from social care and the voluntary sector (no mention of the private sector). There’s no plan to physically bring them together, but instead for them to be supported by undefined ‘community hubs’. Whether there will be staff needed for these teams, whether the agreed funding will prove enough or whether these new ethereal health centres can avoid the setbacks and controversies of their concrete predecessors over the past century remains to be seen. Of course, this isn’t just about which medical services are provided where (or even by whom). It's also part of the much wider canvas of social provision, which stretches beyond the obvious health and social care services. After all, the NHS doesn't exist in a vacuum. Where’s the joined up thinking on prevention? “Prevention is better than cure” was the motto of the National Health Society, founded in 1871 by the world’s first woman MD, Elizabeth Blackwell, the leader of the Victorian public health movement, Edwin Chadwick, and others. One of their key campaigns was for more urban green spaces, in which they were soon joined by Lord Meath’s Metropolitan Parks and Gardens Association and Miranda and Octavia Hill’s Kyrle Society. These city parks and school playgrounds were intended not only to provide the poor a chance for some fresh air away from the slums, but also as a space for the masses to engage in outdoor sports. 140 years ago, their campaigns were based on the understanding that preventing illness means supporting healthy lives in a whole variety of ways. It was this same understanding that led Addison to introduce the first council housing from the new Ministry of Health, and gave Bevan the dual task of beginning the rebuilding Britain’s blitzed cities at the same time as setting up the NHS. In spring of this year, we’re promised guidelines on Putting Health into Place, to build on the NHS’s work with the Healthy New Towns programme to work towards a healthy built environment. But this features in an appendix on how the plan will allow the NHS to help others. Something largely missing here is an acknowledgement that the success of the envisaged shift away from hospital provision rests in no small part on factors beyond the NHS itself. The new plan talks of ‘cutting delays in patients being able to go home’, somewhat downplaying the fact this doesn’t just mean patients being ready to leave hospital but also having somewhere to go. It refers repeatedly to integrating health and social care services, particularly for older people, but the lack of a parallel plan for residential social care is striking. If the government had truly realised that these ambitious plans for the NHS are inextricable from the wider raft of social and welfare services, wouldn’t Amber Rudd be scrapping or undertaking a far more fundamental rethink of the much-maligned universal credit system? Wouldn’t there be a plan to revitalise the local authority public health and social services that have taken such a battering from a decade of austerity? The fact this plan cuts such a lonely figure suggests the government hasn’t begun to grasp the scale of the challenge ahead for our NHS.